The 2016 Junior Olympic Fencing Championships, Cleveland, Ohio. 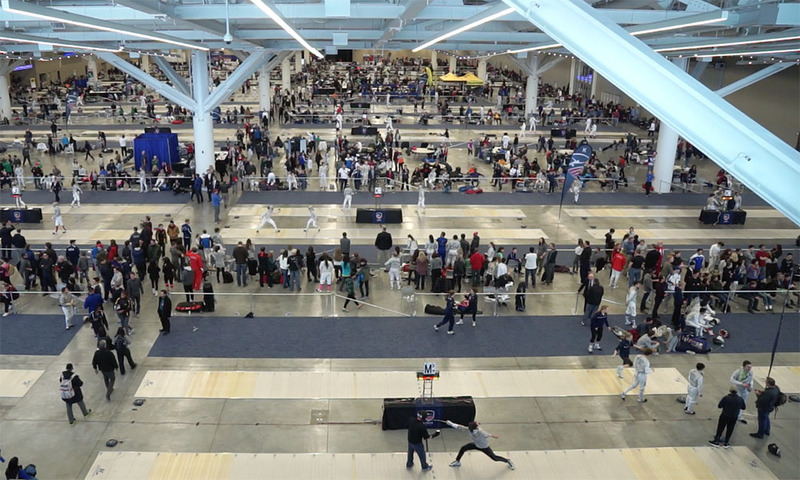 Every February, the top Junior and Cadet fencers in the United States gather to compete in what is essentially the National Championships for Under-20 fencers: The Junior Olympics. But this important and prestigious tournament would have never existed if it wasn’t for the vision and determination of one man. 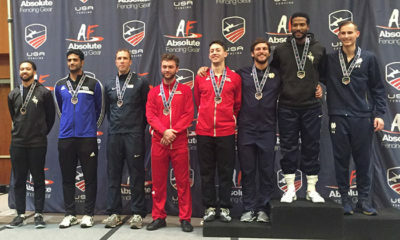 The Junior Olympic Fencing Championships were the brainchild of Rev. Lawrence Calhoun, a name many in the Southern California fencing community will recognize, as he was the fencing coach at Chaminade High School in West Hills from 1987 to 2006 and the founder of the Masque De Fer fencing club. But in 1966, Father Calhoun was just starting his teaching career at Notre Dame High School in Niles, Ill., when the school’s athletic director asked the staff for suggestions for club activities for the students. Father Calhoun suggested fencing. Father Calhoun had never been a coach nor a competitive fencer, but he had become acquainted with the sport while serving as chaplain of the fencing team at the University of Notre Dame during his time as a graduate student, there. Much to his surprise, the high school AD instructed him to form a club immediately. So he sent out a call and six students signed up. Father Calhoun and his fledgling team began frequenting the local YMCA, where his students learned the fundamentals of fencing and he learned to coach. His team lost all of their tournaments that first year, but the next year they went 5-8. By the 4th year the varsity team finished the season with a 15-0 record and were Conference Champions. Before long, Father Calhoun became the head of high school fencing in Illinois, as well as Chairman of the Illinois Division of the Amateur Fencers League of America (now called USA Fencing). The FIE had been conducting a Junior World Championships every year since 1950. 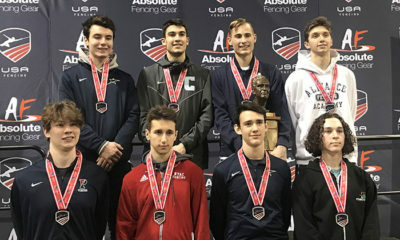 Junior fencers in the US who wished to compete had to go through a very restrictive process that required them to first qualify through their Sectional Championships, then finish in the top three at the US Nationals in June. But the Junior Worlds didn’t take place until April of the next year—ten months later! During this long lag time, it was not uncommon for the young fencers to lose their competitive edge. In addition, fencers who were otherwise qualified, often were over 20 by the time the Junior Worlds came around, so they couldn’t compete. In 1966 the AFLA took the unusual step of changing the Under-20 event at the US Nationals to Under-19. No other country in the world had such an age category. Father Calhoun could see that the US was not going to get its best representation in international Junior competition unless the system was improved. He came to strongly believe that there was a need for a second National Championships, just for Under-20 fencers, that would take place a few weeks before the Junior Worlds. Father Calhoun began attending the meetings of the AFLA in New York to present his big new idea, but no one paid much attention to him. The meetings were dominated by mundane budgetary matters. Just as the business portions of the meetings were wrapping up, he would have to catch his plane back to Chicago. This pattern continued for two years without success. Then, an act of Congress gave Father Calhoun the opportunity he had been waiting for. In 1971, The Uniform Monday Holiday Act went into effect, establishing, among other things, a permanent holiday on the 3rd Monday of every February (which eventually became known as “Presidents’ Day”). That meant there would be a 3-day weekend every year, just two months before the Junior World Championships—perfect timing for a qualification tournament. Armed with this new angle, he presented his idea once again and this time got the response he had been hoping for. He was named ‘National Junior Olympic Development Chairman,’ and published his proposal in the Nov. 1971 and Jan. 1972 issues of American Fencing. It was too late in the year to take advantage of the Presidents’ Day holiday, so the first Junior Olympic competition was set for April. On Friday, April 7, 1972, at 9:00 AM, two saber fencers took to the piste and fenced the first bout of the first-ever Junior Olympic Championships. The strips were set up in the gym and cafeteria of the high school where Father Calhoun taught. The NCAA Champions had just taken place at nearby University of Illinois Circle Campus a few weeks earlier, so all of the necessary equipment was readily available. The electric scoring machines were powered by 48 car batteries provided by Sears. The competition, which lasted 3 days, consisted of four Under-20 events: Men’s Foil, Men’s Epee, Men’s Saber, and Women’s Foil. There were a total of 98 entries from 25 divisions. Most of the competitors were housed and fed by local parents. 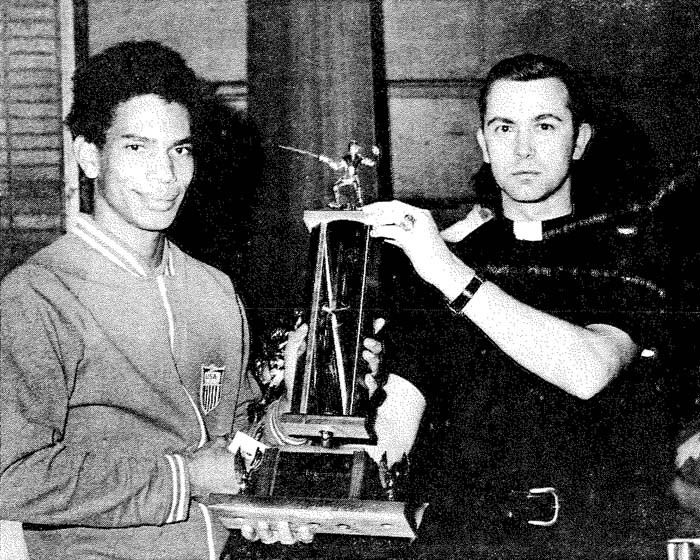 Father Calhoun presents a trophy to Chris Jennings who won the Junior Men’s Foil and Epee events at the first Junior Olympics in Niles, Ill., April 7-9, 1972. 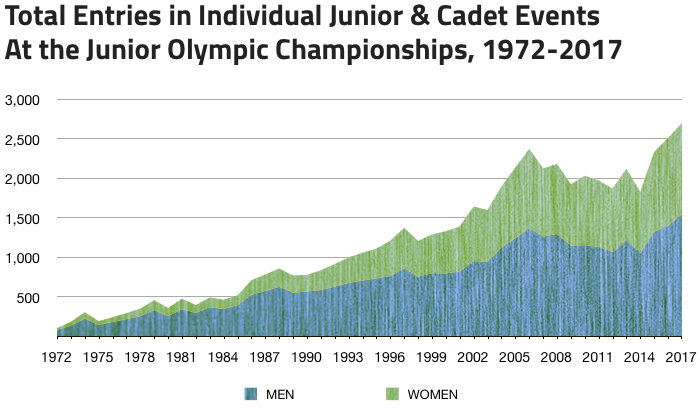 In the following years the format settled in on Under-20 and Under-16 events (changed to Under-17 in the late 80’s), although Under-15, Under-13, and Under-11 events were included for a few years in the early 90’s. Since the addition of team events for Junior fencers in 2010, the program has remained consistent. 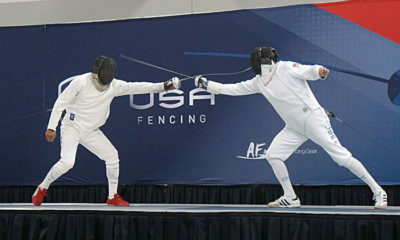 The Junior Olympics have earned their place an essential element in the development of world-class fencers in the United States. USFA Vice President Dr. Ralph Zimmermann called the Junior Olympics “the single most important achievement in the entire history of our organization.” In the summer of 2010, Father Calhoun was inducted into the US Fencing Hall of Fame. The next Junior Olympic Championships will be held in Memphis, Tennessee, on Feb. 16-19, 2018. SoCal fencers who wish to compete should attend the SoCal 2017-2018 JO Qualifiers which will be held at the Sports Academy in Thousand Oaks, California, on Saturday, Dec. 16, 2017. The top 25% will qualify. Jim can't remember a time when he wasn't fascinated by fencing. He currently serves as the Treasurer of the SoCal Division.